Download a printable copy here and help us spread the word! View previous dedications at this location. Download a printable copy and help us spread the word! Information recovered 2018 from King County Medical Examiners/Health Care for the Homeless—we’re grateful! 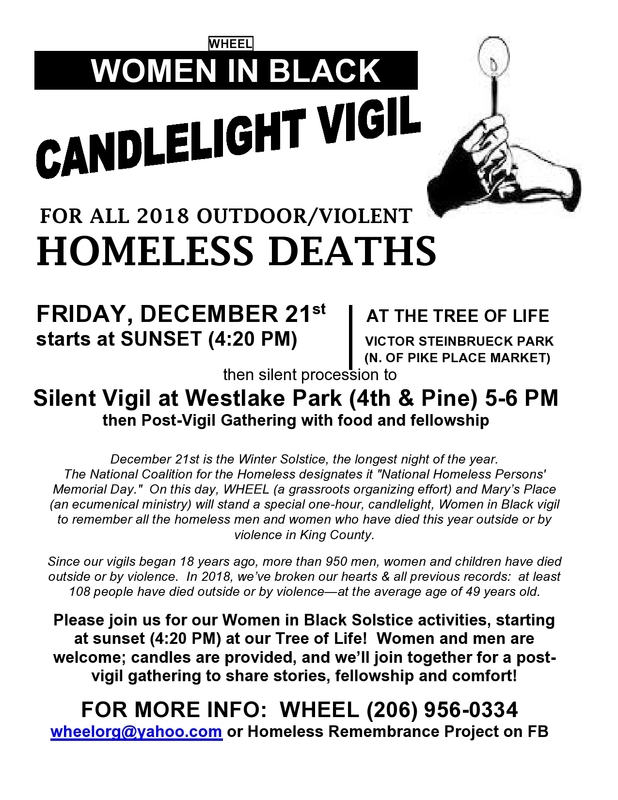 Please join WHEEL/Women in Black at the Homeless Remembrance Project’s Tree of Life (Victor Steinbrueck Park, north of Pike Place Market) at sunset – 4:20 PM – on Thursday, Decembers 21st. We will be honoring all homeless people who’ve died outside or by violence this year in King County–at least 88 already; a shattering record. After a brief ritual at the Tree of Life, we will silently walk through the Market to Westlake Park (4th/Pine) where we will stand a Silent Vigil from 5 – 6 PM. After the vigil, we will gather nearby for fellowship and refreshments. Since our WHEEL/Women in Black vigils began 17 years ago, nearly 800 men, women and children have died outside or by violence. In 2017, we’ve broken our hearts & all previous records: At least 88 people have died outside or by violence – at the average age of 46 years old. Women and men are welcome; candles are provided. For more information: WHEEL (206) 956-0334; wheelorg@yahoo.com or Homeless Remembrance Project on Facebook. For more than a decade, The Homeless Remembrance Project has created places of hope, healing, and beauty to honor and remember homeless people who’ve died in King County. The Project has two parts: A beautiful “Tree of Life” sculpture and gathering place at Victor Steinbrueck Park (north of Pike Place Market), and “Leaves of Remembrance,” with names, embedded in sidewalks—more than 240 throughout the City. 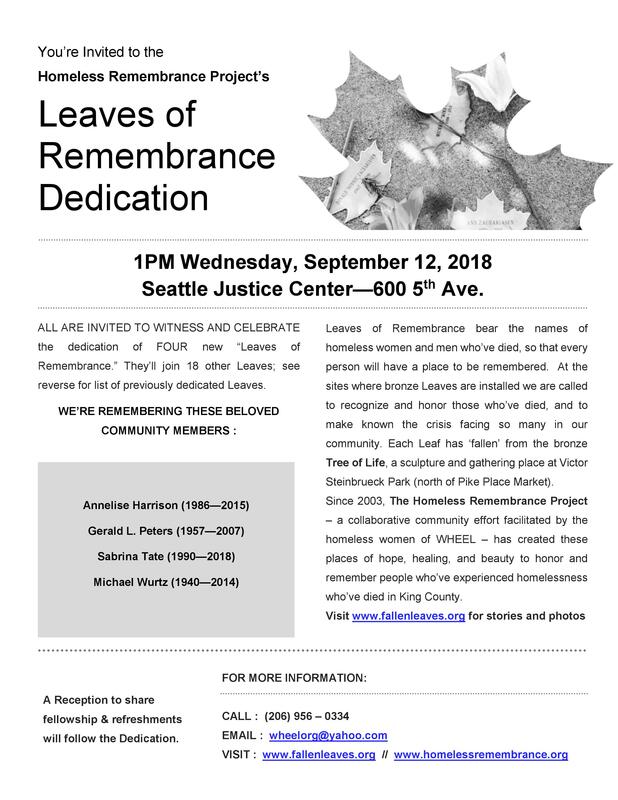 PLEASE JOIN US TO WITNESS & CELEBRATE the Friday, August 25th dedication of twelve “Leaves of Remembrance” at Seattle’s Central Library, on the 4th Ave side.